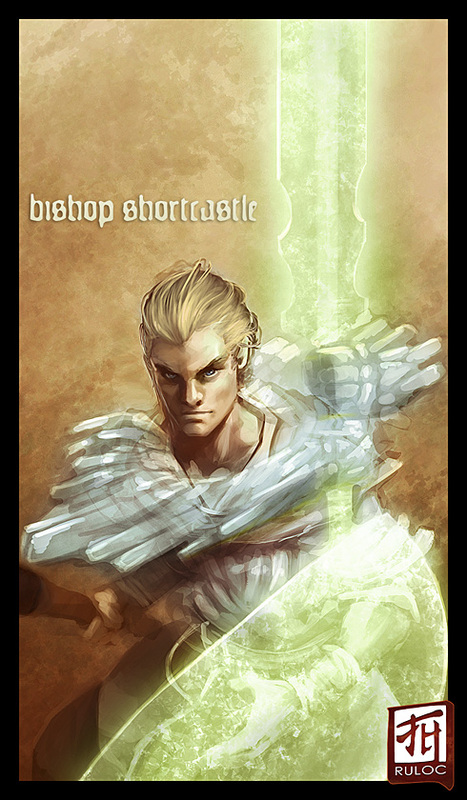 Bishop Shortcastle, Soulknife/Aegis. A blonde, blue-eyed Adonis-like figure in his late 20s, formerly an alchemist by trade, he was experimented on and tapped into his psyche to reveal the psionic power he was capable of, he formed a massive, translucent blade out of thin air and ectoplasmic armor covered his skin. Recently his juggernaut ecto-armor formed an extra set of arms, and his mind blade formed a tower shield (so upper arms a 2-handed mind blade, one lower hand a tower mind shield, and the other hand a torch). His current mission involves the destruction of minions of darkness, so he's sure to have light handy. He's brave in the face of the shadows, but has been cursed a couple times at least. He also makes a point to seem normal, as hard as that might be, so he doesn't carry spare weapons or armor at all. And when he's in town, I imagine him securing his things off of his person before heading into the more populous areas.